Who better to run an eco car wash than someone who understands the value of hard labor, loves the environment, and cares for the future generation? 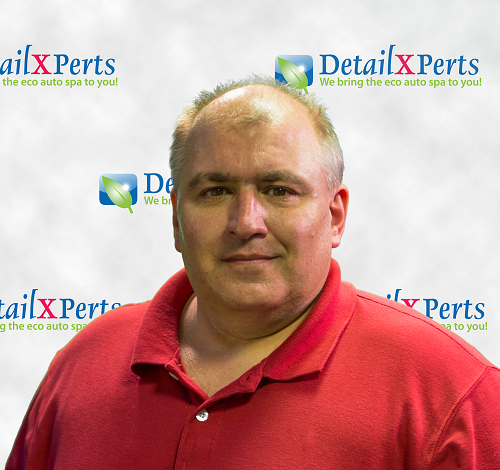 Meet Mike Brown, owner of DetailXPerts of Santa Clara County. He’s not one to fluff his feathers just to make good first impressions. He believes that doing so uses more energy that can be focused on more important things. “What you see is what you get,” he says. He wants to get things done right the first time around. And once he makes a commitment, he sticks to it, no matter what. He’s the type who pushes on regardless of the frustrations that come his way. Since 1996, Mike has worked in the roofing industry, initially as a stacker in the production line, then worked his way up to Quality Control Supervisor, to Operations Manager. Then, in 2010, he started working for another roofing contractor that included photovoltaic solar installations. After attending a presentation and a brief meeting with the presenter at an area unemployment office, Mike looked into four options, eliminated two early on, and decided on DetailXPerts after a month or so. Initially, Mike was very skeptical and even cynical of DetailXPerts. But once he dove into what DetailXPerts was about and its vision, he was hooked. “Ever since I moved to California in 1995, water has always been in the news. This business model fits a need in my area where water restrictions are constant. I liked the people that I talked to and met,” says Mike. California as a whole is still in a drought despite the current rain it had the last couple of winters. Mike believes that most people are extremely sensitive to the water crisis and are open to ways to reduce their consumption. “Since we are close to the bay, runoff and chemicals are a concern as well. So the fact that DetailXPerts is water efficient and green make us all the more attractive – Clean vehicles – Clean Conscious!” he adds. What used to be a search for a business to provide him with financial independence and career stability turned to a desire to build something successful and relevant. Now, he does not simply want to have a stable income; he wants to be a better steward of the environment. In California, water crisis and chemical runoff are two of the most significant environmental issues that affect vehicle owners. They run the risk of paying hefty fines if caught cleaning their prized possession at home. Automatic car washes are an option, but not for those who value their rides. Time is also an issue for Californian vehicle aficionados. To get a car detailed, it takes between 4 to 8 hours the traditional way – wet, soap, rinse, dry, wax, buff and that is just the outside. This is where Mike’s eco car wash comes in. With DetailXPerts’ unique steam process, his expert technicians can provide the same results, if not better in half the time! And since they offer their mobile detailing services to Santa Clara, San Jose, Milpitas, Campbell, Morgan Hill, and Gilroy, customers can continue doing what they’re supposed to do as their vehicle gets the superior detailing it deserves. Mike has very high hopes for his Santa Clara car wash. Aside from giving him additional income, it provides some stability and structure to his professional life, which could lead to a more traditional home life. Mike and his wife work opposite schedules – Mike works mornings while his wife, Orienne, is employed at a local hospital and works nights. This business could allow her to move to days or join him at some time in the future. Aside from car wash and auto detailing, this Santa Clara car wash also offers mobile truck wash, engine steam cleaning, professional car detailing, fleet washing services and washouts, and aircraft detailing. They are equipped with trained professionals who took seminar sessions on eco-friendly mechanisms and proper handling of car cleanliness issues. For inquiries and special rates, call them at 336-365-1650 and schedule an appointment right away!